1972 was the year that our own Buddy Belote's 15 year old daughter Melissa won 3 Olympic Gold Medals in swimming. She was one of the youngest athletes to ever compete in the Olympics. She became a national celebrity that year and was honored all over the country, including the White House. 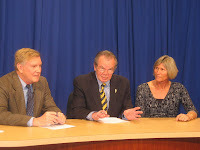 Chuck Langdon and I had the pleasure of interviewing her on Fairfax Cable's OUT OF THE PAST show.